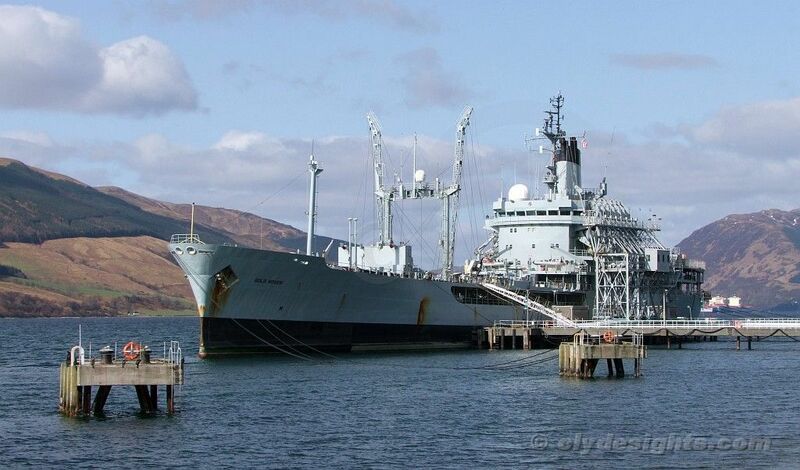 One of the surviving pair of 'Rover' class small fleet tankers, GOLD ROVER, was seen at Loch Striven oil jetty, preparing to sail shortly for Birkenhead, where she is due to undergo a refit. Having recently returned from duty in the Falkland Islands, GOLD ROVER has been stripped of some of her equipment for replenishment at sea, most notably the oil transfer hoses carried on the derricks midships. 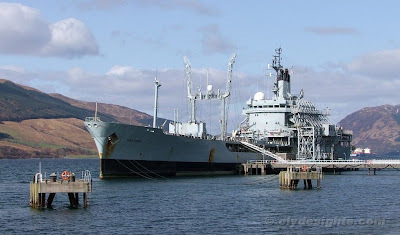 Having been built in 1974, the veteran GOLD ROVER is now the longest serving Royal Fleet Auxiliary ship and had moved to Loch Striven from Glen Mallan, at which she had arrived a few days previously. Both she and her sister, BLACK ROVER, which are single-hulled tankers, have remained in service beyond expected withdrawal dates, while delays in procuring new double-hulled tonnage under the Maritime Afloat Reach and Sustainability programme remain unresolved.